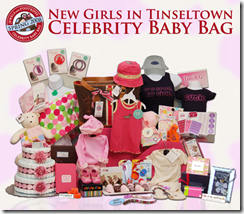 Bid and win popular celebrity baby bags from Jewels and Pinstripes | Unique Mommy and Baby Clothes at Tuni & G.
Get a chance to win a New Girls in Tinseltown gift bag and a Jewels and Pinstripes Celebrity “BUMP” Gift Bag. Jewels and Pinstripes is a premier designer of luxury gift bags, specializing in creating VIP thank-you bags for charity benefits and high profile events. They’re auctioning off two of their most popular celebrity gift bags which are created for celebrities but now you can get one for yourself! Proceeds of both these auction items will benefit Plasticos Foundation! 1 Enter to win a Celebrity BUMP bag on Extratv.com « Unique Mommy and Baby Clothes at Tuni & G.